The work of a brilliant and imaginative French engineer, the Eiffel Tower stands to-day, a dominant landmark of Paris, towering nearly 1,000 feet above the banks of the Seine. The story of its conception and construction is unique in the history of engineering. 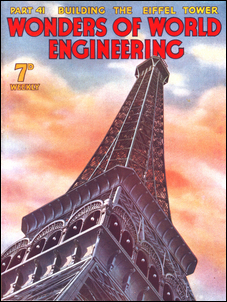 This article was first published in 1938 in Wonders of World Engineering. “Surely, M. Eiffel," said the Minister of Commerce and Industry, "you cannot be serious!" It was a spring morning in 1886. Paris was already preparing for the great Exhibition of 1889, which was destined to surpass anything of the kind previously attempted. The harassed M. Edouard Lockroy—com­pelled, as Minister of Commerce and Industry, to shoulder the final respon­sibility for all arrangements in connection with the Exhibition—had already con­sidered and rejected many suggestions for a novel and striking "principal feature." Now here was another which, for sheer audacity, beat them all. Yet its sponsor was not the usual hare-brained visionary, but a well-known engineer in the front rank of his pro­fession. M. Eiffel could point with pride to an impressive list of achieve­ments during the previous thirty years, and he had done a great deal of useful spadework for the Paris Exhibitions of 1867 and 1878. If his plan proved feasible, the problem of providing a main attraction for the 1889 Exhibition was solved. Such a stupendous tower as M. Eiffel proposed, with calm confidence, to build in time for the opening in May 1889 was a thing which—excluding what might or might not have been done at Babel long ago—the world had never seen before. It would form, Lockroy re­flected, a monument to French genius and to the unquenchable spirit of the French people and a proof that France was still, as ever, to be found in the vanguard of the world's progress. Before long Lockroy's mind was made up. He told Eiffel to go ahead. At first the project met with consider­able opposition. 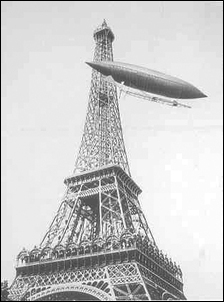 No sooner had Lockroy officially announced that the 1889 Exhibition would be dwarfed and dominated by a colossal iron tower 300 metres (984 feet) high, designed by the well-known engineer M. Gustave Eiffel, than the intelligentsia of Paris denounced the scheme. 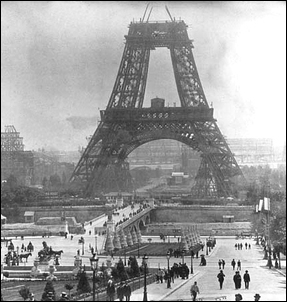 Work on the tower, however, was not delayed; in a short time Eiffel had completed his detailed plans and was laying out his foundations. His design, bold and fantastic in outline, has long been recognized as being in its way a masterpiece—a work of real genius. Today his tower still stands as the crowning achievement of a career which up to then had been uniformly successful. 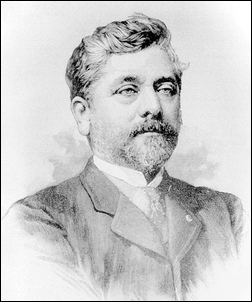 Alexandre Gustave Eiffel was born at Dijon on December 15, 1832. He set up for himself as a civil engineer in 1855, and soon attracted attention by his use of compressed-air caissons—a method little practised at that time in France—in laying the foundations of the great Bordeaux railway bridge. He next specialized in the building of iron bridges and viaducts, and intro­duced a bold departure from accepted practice by using, instead of the cast-iron or masonry piers then prevalent, built-up, braced girder structures of wrought iron. 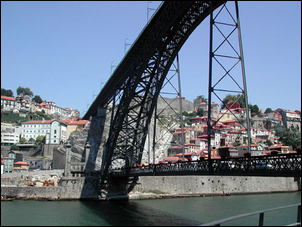 His bridges included the great one (pictured) across the River Douro, at Oporto, Portugal, with a main span of 534 feet, carrying the permanent way at a height of 200 feet above the river. His viaduct at Garabit, in southern France, was even more daring; this was a wrought-iron arch of 541 feet span rising 400 feet above the torrent of the Truyere. Apart from these major interests, he had been responsible also for the main Pesth railway station (Budapest, Hungary) and for such work as the internal metal skeleton of Bartholdi's huge Statue of Liberty. 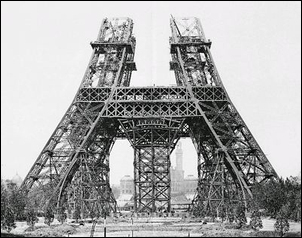 Eiffel was not the first, or even the second engineer to propose the erection of an iron tower of enormous height. A similar proposal had been put forward ten years earlier by the American firm of Clark and Reeves, who offered to build for the Philadelphia Exhibition of 1876 a wrought-iron tower 1,000 feet high and 150 feet in diameter at the base. Their "Column of the Republic", how­ever, never materialized. Similar projects had been made much earlier. A plan for a 1,000-feet iron tower had been put forward in 1832 by Richard Trevithick. Trevithick's "Golden Tower" was designed to commemorate the passing of the Reform Bill of 1832. The design envisaged a cast-iron cone, 1,000 feet high; the diameter was to taper from 100 feet at the base to 12 feet at the top. The estimated weight of the tower, built up of 1,500 symmetrical hollow segments, was about 6,000 tons. The scheme, however, never eventuated. Eiffel's project had one important advantage over its predecessors. It was the work of an expert dealing with a subject with which he was perfectly familiar. A tower of the size proposed must, necessarily, be of metal. The Washington Monument (555 feet high, built-up, and virtually solid throughout) is not far from the limit of height that can safely be reached with stone; above that, either the foundations would give way, or the lower stones would be crushed under the weight of the struc­ture. Moreover, cast iron was too brittle to be suitable, and engineers still fought shy of large steel-framed structures, so that a tower of the kind required was more or less bound to be a skeleton structure of wrought-iron girders. No man had had more experience of design­ing and building such structures than Gustave Eiffel. Eiffel's tower was a logical develop­ment and extension of the methods he had used in his great iron bridges. The original idea of the tower seems to have struck him while he was engaged in investigating the extreme possible limit of size for a bridge on the lines of the Garabit Viaduct. In designing his piers and towers he had always striven to give their principal members such a curvature as would, of itself, have a maximum of lateral rigidity, and so resist the effects of wind pressure with­out excessive diagonal bracing. He was therefore led, naturally and almost inevitably, to design his great tower as a tall pyramid with curved edges, these edges being composed of four huge built-up columns, leaving the ground independently of one another, connected (at various levels) by hori­zontal girder frames, and ultimately merging (about half-way up) into a tapering, diagonally-braced shaft of square section. His final design provided for two intermediate platforms, whose floors were to be respectively 189 and 379 feet from the ground. The tower itself was to end at a height of 896 feet. On the top there would be an observation platform 53 feet square; from this would rise a campanile surmounted by a dome and lantern, bringing the total height of the structure to 984 feet. Such was the plan for the Eiffel Tower, and such are its dimensions to-day. The flagstaff above the lantern rises slightly beyond the 1,000-feet mark. On January 8, 1887, a convention was signed which laid down the final conditions governing the building of the tower. It had been decided that the 1889 Exhibition was to be held in the historic Champ de Mars. The tower would therefore have to be erected on the central axis of the Champ de Mars, not far from the south bank of the Seine and immediately facing the Pont de Iena, on land belonging to the city of Paris—not, as does the greater part of the Champ de Mars, to the nation. There were thus three parties to the convention—the Government, the Paris authorities and the private company contracting to build the tower. The company undertook to do the work with its own resources (less a Government grant of 1,500,000 francs) and to com­plete this before the date of the Ex­hibition's opening. In return, the com­pany was granted a twenty-years' lease of the site, and the right, during the Exhibition and after, to levy tolls on all wishing to ascend the tower. In 1909 the tower, if it stood so long, would become the property of the Paris municipality. Work on the foundations began immediately, the four sets of piers being located at the corners of a square, with their centres some 330 feet apart. Pre­liminary borings, showed that under the sites of all four piers was a bed of hard, compact clay, more than 50 feet thick and able to bear a loading of from 3 to 4 tons per square foot. Overlying this was a stratum of hard gravel—which, for the two piers remote from the Seine, came to within 23 feet of the surface. Here there was no great difficulty in excavating down to the gravel and form­ing concrete foundations for the stone­work of the piers. But with the two piers nearest the Seine (about 300 feet away) conditions were not so favourable. Here the gravel was struck at a depth of 40 feet, that is, 16 feet below the mean level of the river. On top of the gravel were soft deposits through which water persistently oozed; and there was the possibility of similar deposits occur­ring between the gravel and the clay. Eiffel could not afford to take chances; so he pushed his caissons through the gravel and found, to his great relief, that, lying between the gravel and clay was a thick stratum of hard, fine sand —better, for load-bearing, than even the clay itself. When the concrete foundations had been carried high enough the masonry work began. Each "edge" of the huge iron pyramid—each "leg" of the tower—was to be composed of four huge iron box girders, connected by lattice girders to form, in effect, a skeleton tube of square section about 50 feet each way. Each of the four enormous box girders composing one "leg" of the tower had its own pier, so that there were sixteen piers in all to be built. These were arranged in groups of four, in small squares, and each of these four squares was situated at one corner of a large square. The stone used for the piers was capable of supporting a load of over 1,600 lb. per square inch—roughly, four times the maximum stress which the weight of the tower could impose on it. Iron bolts 20 feet long were built into each pier to hold the lower ends of the girders. 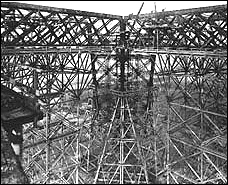 Although the completed tower's weight (rather over 7,000 tons) would make it perfectly stable without any such anchorage, Eiffel kept to his policy of taking, during the building of the tower, no risk that he could possibly avoid. A gale might strike the tower before it was half finished, or a sudden emergency might necessitate bringing a heavy load on the structure a long way from its axis ; in either event, neglect to anchor it might have fatal conse­quences. 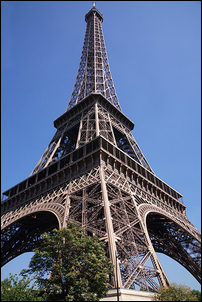 Eiffel even went so far as to provide, at each pier, a permanent hydraulic press, forming part of the anchorage, by means of which the whole gigantic structure, once completed, could be tilted bodily if it deviated measurably from the perpendicular. This deviation never occurred. Above the piers came the beginnings of the ironwork; and the Parisians, for the first time, began to catch a glimpse of the huge iron monster which was so soon to tower above their beloved city and to form, in after years, their most, familiar landmark. The huge box girders, with their connecting lattice-work, began to climb away from their piers, inclin­ing inwards at an angle of some fifty degrees to the ground. So far were they apart that for a long while they resembled independent structures. It was diffi­cult, if not impossible, to realize that they were only structural com­ponents of a single gigantic building, that they would presently form the buttresses and corner-posts of a huge platform (No. 1) sup­ported in mid-air nearly 200 feet above the ground. 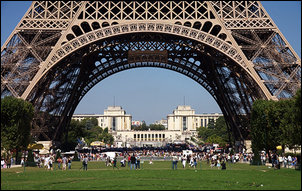 The ironwork arrived daily in huge loads on the Champ de Mars, being delivered by Eiffel's factory in fin­ished condition and riveted as far as pos­sible. The planning of the ironwork necessi­tated the production, apart from the vast amount of preliminary designing, of 12,000 working scale drawings. The total weight of iron to be set in place was 7,300 tons, plus 450 tons of rivets, of which there were 2,500,000 in all. In addition, Eiffel was compelled by force of circumstances to depart from one of his most cherished principles and to use, in the early stages, a complicated system of huge temporary wooden sub­structures. He had contrived to build his great bridges, piece by piece, without using any wooden centering for their arches. The great weight and pro­nounced inclination of his box girders compelled him, however, to support them with triangulated wooden columns before they had climbed more than half­way to No. 1 Platform. At the tops of these columns were “sand-boxes", against which the box girders abutted; and in this way an exact adjustment could be obtained. If, at the junction with No. 1 Platform it was found that a girder was slightly too high, a little sand was run out of the box and allowed the girder to sink to its correct position ; if the girder was found to be too low, it was raised by hydraulic jacks. Paradoxically, the erection of that portion of the Eiffel Tower nearest the ground—the first stage, from ground level as far up as No. 1 Platform—was by far the most difficult and dangerous part of the whole undertaking. The amount of forethought devoted to the planning of the structure, down to the minutest detail, was scarcely credible, and reflected the greatest possible credit on Eiffel and his assis­tants. The erection of the tower proceeded without a hitch, and with scarcely an accident, from start to finish. Eiffel could rely, too, not only on the active cooperation, but on the whole-hearted devotion, of every worker. But he must have been profoundly relieved when at last the four great "legs" of the tower were firmly united by an all-round belt of horizontal girders, and the main framing of No. 1 Platform (193 feet square) was bolted into position. Here, in any event, was an immensely strong base from which his lofty central shaft would speedily rise. The means used for getting all the material into position, ready for bolting up, were simple and efficient. For the first 50 feet or so from the ground derricks were required; above this it was necessary to use some method which would keep pace with the framework as it rose. Visitors to the completed tower would have to be taken up in lifts. 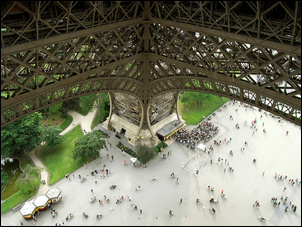 Eiffel's design pro­vided for four main lifts from ground level to the No. 2 Platform, the track of each running up one "leg" of the tower. From the centre of No. 2 Platform, at which point the inclined tracks of the four main lifts came to an end, a vertical lift-shaft ascended to the campanile. For the work of erecting the tower, therefore, a simple form of crane was designed which could be bolted to, and shifted along, the lift tracks as these were got into place. In addition, other cranes were installed on the platforms; these cranes hoisted material from the ground and delivered it on a circular railway track temporarily laid down on the platform, to wherever it might be required. 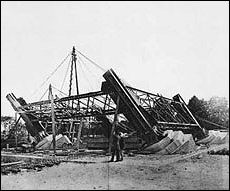 In the later stages of the work, when the main girders of the tower were rising almost vertically, the movable cranes (weighing 12 tons each) were coupled back-to-back on either side of the girders, thus ensuring that the unbalanced weight thrown upon the girders was kept as low as possible. As the tower rose above No. 1 Platform, the work gradually acceler­ated. Because of the tapering and converging of the principal frame-members, the weight of the component units gradually diminished, as also did the horizontal distance through which they had to be shifted into position. The risk of accident was great—far more so than in a modern skyscraper—for the tower, while under construc­tion and when complete, was an open iron skeleton, without any intermediate floors at all, except the two platforms. Yet so well did Eiffel take care of his men with movable stagings, guard-rails and screens, that during the whole work only one man was fatally injured. The framework had risen to the level of No. 2 Platform by July 1888, and the national fete on July 14 was cele­brated by a firework display at a height of 379 feet above the ground. Still the big box girders crept higher day by day until, when some 500 feet up, they finally united and drove upwards verti­cally. 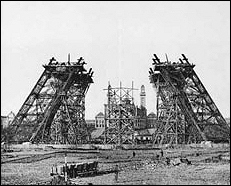 In the early days, of 1889 the main frame had reached its designed height —896 feet, the level of the campanile floor; and by the end of March the campanile itself was in position. The lift-tracks were already in place, having been used for the cranes; and the lifts soon followed. And then Eiffel, with the dramatic instinct of a true French­man, installed himself and his staff in a room in the campanile, and sat down to pursue his practice, as a consulting engineer, in an office supported, by his miracle of modern engineering, a thousand feet in the air, with all Paris—and, for the moment, all France—at his feet. The tower's obvious success led, almost immediately, to the flotation of a British company which proposed to go one better. The chairman of the company was Sir Edward Watkin, well known as a railway magnate. It was proposed to build an improved tower, on the Eiffel model, 1,209 feet, high, and variously designated as the "Watkin Tower" or, from its site in Middlesex, the "Wembley Park Tower". The site was cleared, the foundations were laid, and the structure was carried up as far as the first platform. At this point, the available funds having been exhausted, the work was discontinued. In 1896 lifts were installed and the platform was opened, as it stood, to the public; but some years after Watkin's death the tower was demolished and the debris removed. In 1910, shortly after the original concession had expired, the Eiffel Tower became the centre of French radio trans­mission. Thus the tower was given a fresh lease of life—one which it seems likely to enjoy for a good many years to come.